The Trolley Dolly is great to transport items around while on-the-go, downtown or the business. Large comfortable handle with rubberized grip reduces the shock when it is being pulled. Oversized, beefy wheels allow smooth rolling on any surface, even uneven paths. Removable shopping bag features seven compartments and pockets including a beverage holder. It is made of strong, weatherproof material. Remove the shopping bag, and the Trolley transforms into a Dolly for amazing weight capacity of 110 lb. 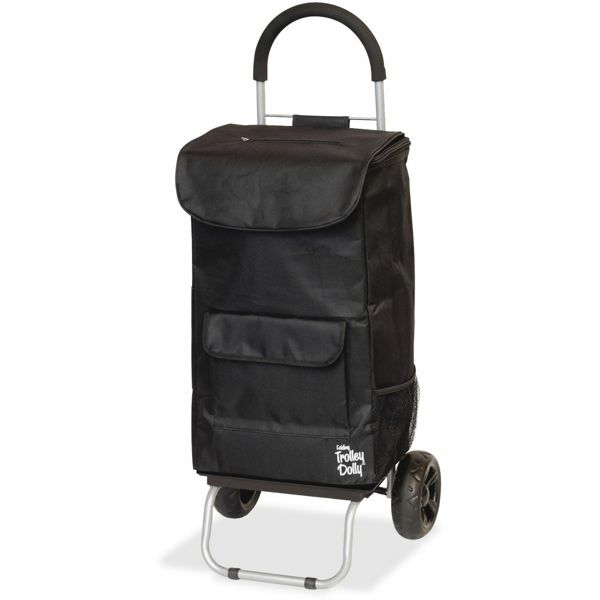 The Trolley Dolly is the ideal solution to move a wide variety of items with ease. It folds in half the size of traditional trolleys for compact storage anywhere when not in use. The frame is made of durable aluminum.